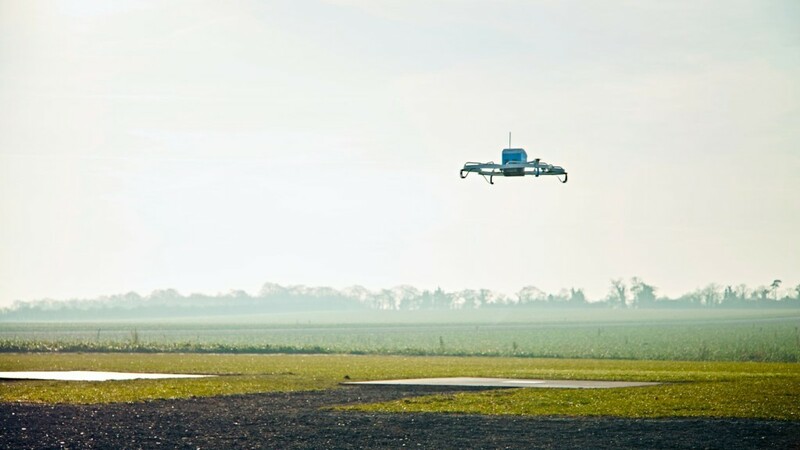 A short flight for a drone, but a huge step for the multibillion dollar e-commerce industry. Amazon has just made a delivery within 13 minutes of the order being placed. And it wasn’t because the order was made right next to an Amazon warehouse – the delivery was done by a self-propelled drone. The lucky recipient of the delivery was Richard B, a customer in Cambridge, England. Immediately after he’d placed his order, an Amazon fulfilment center worker put his order securely in a box, and it was then carried through a conveyor belt to a waiting drone. The package was sucked up by the drone, which then proceed to exit the warehouse through a pair of tracks. After it was out in the open, the drone took flight. It then flew to a height of 400 feet, and then autonomously guided itself to Richard’s house using GPS. Once at the drop location, the drone gently lowered itself to the ground, and dropped the package for the customer to pick up. It then took off, ready for its next assignment. The entire process, from the order to the delivery, took 13 minutes. It sounds like science fiction, but Amazon seems confident that this is what the future of deliveries is going to look like. “One day, seeing Prime Air vehicles will be as normal as seeing mail trucks on the road,” the company says. The technology is admittedly in its trial phases – it has only 2 beta customers, and for now the drones carry packages that are lighter than 2.2 kg. The drones also only fly during the day, and can’t function during rain, snow or icy conditions. But the initial trial has been successful, and Amazon says it will soon extend Amazon Prime Air – that’s what it calls the service – for 30 minute deliveries. And if Prime Air does go mainstream, it’ll have tectonic effects in the e-commerce industry. Customers will have access to goods faster than ever before. Millions of delivery jobs could suddenly wiped out. And Amazon could drive a wedge between itself and the competition with its superfast deliveries. There are exciting times for e-commerce, and Amazon seems to be right at the forefront of the cutting edge developments.